As I've mentioned before, when designing a game, you start out with a vision of what you want your game to look and feel like when you play it. You make a prototype (which turns out to be rubbish!) and then start making incremental changes trying to improve the game while keeping in mind your original goals. My original idea for Codename: Vacuum was a deck-building card game set in space. Over time the theme has been tweaked slightly to being set in a steampunk-esque version of our solar system between the years 1900 and 2100. That's not a big change though, It's Alive! went from collecting different coloured candles to light a Menorah to being about collecting different body parts to build Frankenstein's Monster! But the game components have changed during that time too. The initial plan was to have a pure card game (like Dominion), but as the game idea was fleshed out in my head I thought it would be good to add some wooden tokens. I added some coins to allow a more interesting trade mechanic, and some 'Explore tokens' to introduce another scoring mechanism/path to victory. 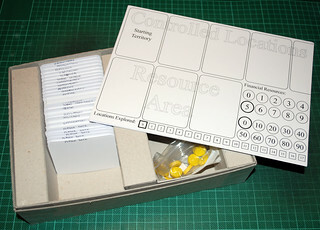 This box for an early version just about fits the cards and wooden bits, but is obviously not designed for getting pride of place on a shop shelf! In the latest version that I've just finished assembling over the weekend I've got rid of most of those tokens, and replaced them with with player mats and coin/explore tracks instead. The player mat allows me to reduce the numbers of wooden tokens by quite a lot (reducing cost), but also to justify a large box size (which makes sense for the game as it brings the box size in line with Race for the Galaxy, a game with a similar number of components. My initial plan was to have a turn overview, coin and explore token tracks and spaces for all your cards on the player mat. There's not really enough room for those things without the turn overview though, so that's had to go. Maybe I'll add some turn overview cards instead. Codename: Vacuum is the game that is infecting my brain at the moment. It's always at the back of my conscience, thinking of ideas for tweaks, improvements and major changes. The game is in the early stages where I'm thinking much more about it than I'm playing it so it's not unusual for me to make three or four sets of changes between plays - in some cases they are all changes on the computer before I print it out for testing, in others, no sooner have I printed a copy than I've had another idea and started making another slightly different prototype on the computer before I've even had a chance to play the copy I've just printed and cut out! What am I hoping to achieve with all these changes? Fun! The game should be a fun experience to play. There should be interesting decisions at every turn, the chance to surprise or stiff you opponents and a enough randomness and luck that it doesn't feel dry and samey. Fast! I want to game to have a similar play time to Race for the Galaxy, i.e. experienced players can play it in around half an hour. Consistent: I want the game to be easy to learn and easy to play because things make sense, the various bits of the game are consistent with each other - the rules aren't a mess of special cases and exceptions. Well themed: The theme is consistent with itself and the game works with respect to its theme. 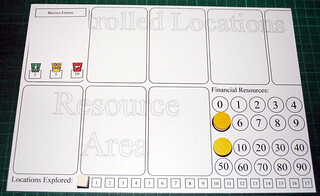 Streamlined: The game is as simple as it can be while maintaining an interesting challenge and great experience. Obviously, you don't start with something that perfectly meets those criteria, you starts with something that captures an idea in your head, and then through multiple tests, feedback and iterative changes you move that initial version towards a final game that meets those criteria. When making changes you need to hold that initial idea of how you want the game to work in your head and then tweak the current version incorporating the playtest experiences and feedback using those criteria as yardsticks: if I make this change will it make it faster? Or slower? Does it improve the consistency? Would this change make it more fun? Sometimes you'll have an idea that improves it against one of the criteria but makes it worse against another. Is it acceptable to streamline the game if it reduces consistency slightly? It depends, but you've got to make that call on all the ideas you have. So what is the overall idea that is driving Codename: Vacuum development? I wanted to make a game that plays in around 30 mins with experienced players. I wanted a deck-building game with a tableau element (like Race for the Galaxy) but with direct interaction between players. I wanted a steampunk game that evolves through the passage of time into a proper sci-fi game. I wanted multiple paths to victory. Sounds like a tall order? I've set the game in a fairly standard steampunk setting (imagine the works of Jules Verne, H.G. Wells, Arthur Conan Doyle and Edgar Rice Burroughs) but unlike the majority of steampunk games there's a passage of time from around 1900 through an alternative modern day to a hundred years in our future). It's set in our solar system, but a solar system with men in the moon, Martians, Jovians and lots of other extra-terrestrials. The game is a deck-building game, but you can play a few cards to your tableau where you can make use of them every turn, driving the shape of your strategy. You can explore the solar system, trade with other players and neutral locations, use your military to attack and claim the neutral locations or those claimed by an opponent and you can research technologies to improve your strengths in various areas. Come the finale, you get to pick from ten scoring cards to determine on which criteria all the players will be scored. As with most deck-building games, there are several sets of cards and you play with a subset of them, so each game will be slightly different depending upon the randomly selected subset chosen for this game. Hopefully that description piques the interest of a few people and everyone's not sick to the back teeth with deck-building games. In the meantime, I need to keep testing it out and making the tweaks until it's in a position where I can send copies to blind playtesters for the all-important feedback about whether it's worth pursuing. As many of you know, I ran a board games publishing company for five years: Reiver Games, from July 2006 to July 2011. I ended up selling off 3,000 games to a liquidator for 12p each, and lost about £8,750 (thankfully of insurance money and not my life savings!). Clearly something when very wrong. And yet, I managed to sell 5,500 games and the company started off very successfully. So where did it all go so hideously wrong? What would I do differently if I was starting now with the knowledge I've gained the hard way? After years trying to write tiny bits of computer games and a bad experience with Mighty Empires, I started designing Border Reivers at the end of 2002. I spent a couple of years playtesting it with a close group of not-really-gamer friends then I shelved it, and didn't come back to it until 2006 when I had the idea of forming Reiver Games and seeing if I had what it takes (and Border Reivers had what it takes) to sell a game. I tried the game with real gamers in York and got pretty good feedback, so I convinced The Wife (using only fast talking and The Dummies Guide To Hypnotism) to let me invest £1,250 of our paltry savings in setting up a company to sell my game. I did all my sums and reckoned I could at a stretch sell 100 copies, and figured that £30 was a reasonable price for a home-made, limited edition game. One year after forming the company I has sold all my stock of Border Reivers, and my bank balance read £2,500 - a 100% ROI! So far, so awesome. During that year, I'd been extensively pimping my game on BGG and had been approached by another designer (actually several other designers, but only one that made the cut) and had decided that I should do a similar home-made, limited edition of his game: It's Alive! With the benefit of hindsight and a lot more gaming experience under my belt at the various cons and games clubs I'd attended, it was clear that Border Reivers wasn't actually a very good game. It's Alive! was a tighter game with much broader appeal (who doesn't love body parts? ), so I took another punt and decided to hand-craft 300 copies of It's Alive! By July 2008 I had sold all of those, and my bank balance read £4,500, nearly another 100% ROI. This was awesome! If I'd stopped there Reiver Games would have been fantastically successful - beyond my wildest dreams. Then everything changed. During 2007 I'd been diagnosed with Multiple Sclerosis, and despite the treatment I was receiving I felt that my condition was worsening fairly quickly. I had a good job, but wasn't overly enamoured of it, and both The Wife and I were getting fed up with the amount of my 'free' time and holiday allowance I was spending on the company, cutting out and assembling games, checking and responding to emails, doing PR and blog posts and endless trips to Post Offices the UK over. This was not sustainable. Something had to give. Conveniently, about this time, we checked my life insurance policy, and it turns out the critical illness cover I had taken out covered MS. A few phone calls and forms later, and I was in the frankly bizarre situation of being able to spend my own life insurance payout (without the fear of fraud charges that usually accompanies it!). We paid off the vast majority of our mortgage and (with more fast talking and liberal resorting to The Expert's Guide to Hypnotism) The Wife agreed to invest a chunk of the insurance money in Reiver Games (with another chunk put aside to live off while I had no salary income). This was a turning point in lots of ways. It's when I started selling to shops, online stores and distributors, when I started getting the games made professionally, when I started attending Spiel in Essen and when the company started to fail. I was keen that the company take off to the point where it could provide a salary for me and be a genuine job, not an excuse for bumming around. To do that I figured I would have to make and sell a lot of games. While the hand-made games had been a huge success for me, making them was a real chore. I wrecked our coffee table, was frequently cutting my hands and they often ached. Each copy of Border Reivers took 3 hours to assemble, It's Alive! 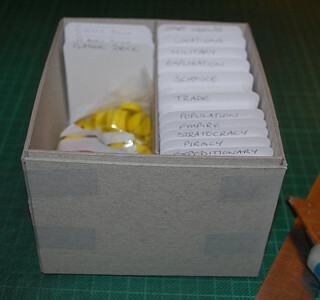 one and a half - and that wasn't counting things and putting them in a box, it was cutting the box and tiles out of 2mm greyboard, folding, gluing, labelling, cutting the cards out and counting and sorting. I didn't fancy doing this day in, day out (plus I'd have ended up with RSI in no time!). My first mistake was to price It's Alive! Second Edition at the same price as the hand-made edition, rather than the price dictated by the manufacturing cost. The second: getting a loan to publish Carpe Astra that I would spend the next two years paying £330 a month to service. This was compounded by manufacturing too many copies of those games. I made 3,000 It's Alive!, 2,000 Carpe Astra and 3,000 Sumeria. I should have done 2,000, 1,000 and 1,500 respectively - that's what I sold in a sensible time. I tried to move from being a small hobby publisher with a dedicated, but small, army of fans to being a full-size pro publisher with professionally manufacturer games and sales and distribution channels. And I tried to do it too quickly. If I was a marketing genius, it's conceivable that it could be done, but it was a long shot and I didn't have it in me. Of course, things have changed since then. KickStarter is a game-changer in the games publishing market, not only has it helped smaller companies like Tasty Minstrel flourish, but even big players like Eggertspiele and Steve Jackson Games have used it recently. It's a great combination of funds raising, market research, pre-order management and just listing a game there gets you loads of advertising to help you attract customers. Although my first couple of years as a pro publisher were technically profitable, I was making very little money and it was clear that I had way too much inventory left. The loan payments were eroding the money I was getting back from sales and I didn't have enough cash to publish a new game - so, as with most businesses, it was cash-flow that killed me. In hindsight, what I should have done was a halfway-house. Getting the games made professionally, but in small runs that I could sell directly to gamers and at cons. Going through shops and distributors, while it got me lots more sales, meant I had to make a lot of copies to get the costs low enough to sell to distributors and I had to squeeze my margins to unworkable levels. Maybe a thousand at a time would have been a sweet spot, but without shops and distributors on board even that may have been too many. And, had I waited a couple of years, I should have used KickStarter!